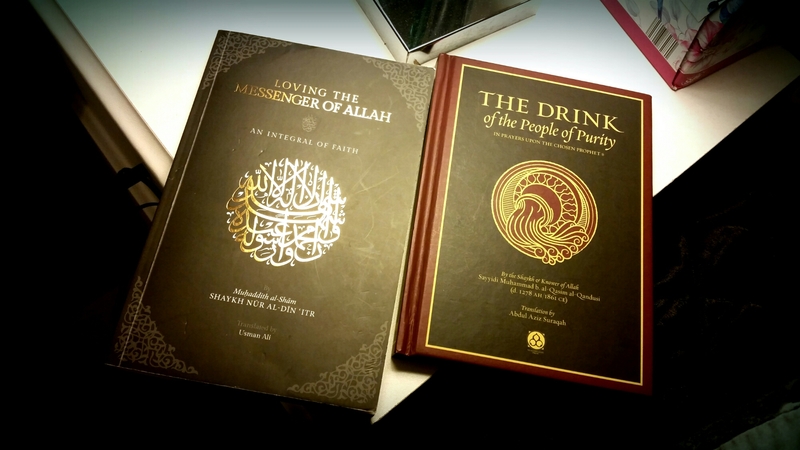 Just finished the book on the left: a short treatise on loving the Messenger of Allah by the great Hadith Master of Syria Sh. Nur Al-Din Itr. Particularly enjoyed the stories of companions at the end, alongside the practical steps it gives on how to increase in Love for Him (salla Allahu alayhi wasallam). Highly recommend! … No sooner did I put it down than I was handed another beautiful book to read by a dear friend of mine whom I know is from the people of purity the book describes. It’s a guidebook for seekers who wish to deepen their connection with the Prophet Muhammad (salla Allahu alayhi wasallam). He’s given me a week to read it and give it back! Looking forward to this! September 7, 2015 in Book Recommendations.